Commercial viticulture began in Marlborough in 1973 with the first plantings on what is now the Brancott Estate, just south of Blenheim. Within ten years, production in the Wairau Valley was well established and the region’s international reputation was beginning to grow. Flat land close to Blenheim suitable for vines was in heavy demand. In 1986, the Vavasour family extended Marlborough’s wine growing footprint south into the Awatere Valley, producing their first vintage in 1989. Cooler and drier than its neighbouring valley north of the Wither Hills, the Awatere’s proximity to the coastline and strong offshore winds give wines produced there their own distinct character. Expansion of grapes in the Awatere really took off in the late 1990s as suitable Wairau Valley land became largely exhausted. Now the cycle has turned and the only remaining substantial sheep and beef farm in the lower Awatere Valley is up for sale. 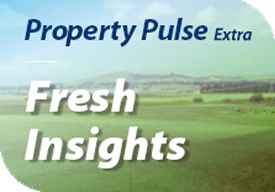 Nelson/Marlborough Sales Manager for PGG Wrightson Real Estate Joe Blakiston has listed the approximately 166 hectare property, Kilkishen Farm. “Both the farm itself, and market conditions, are ideal for a change of land use, from traditional sheep and beef, to viticulture. As the final significant Awatere block not yet in vines, Kilkishen Farm has a particular value, especially as over recent harvests, with favourable conditions, some fine grapes have been grown locally. In sauvignon blanc, this magnificent farm will go to a new level,” says Joe. Phil Dasler is Marlborough sales manager for FruitFed Supplies. He has seen that change as viticulture has become the Awatere’s predominant land use, and grapes are not planted on around 9,000 hectares of the valley. “Previously, it was all drystock, and farmers were at the mercy of the season, with no capability of controlling their risk as other regions have. There is no aquifer in the Awatere, meaning the only source of water is the river, which is a fickle beast. Sometimes it becomes cloudy and murky, and you can’t draw water from it. Without reliable water, drystock farming was always a challenge here. “Back in the early 2000s bare land was changing hands for $30,000 per hectare, and we thought that was crazy. Now the traditional shelter belts are largely gone, with smaller ones in their place, and vines in every direction,” he says. Bare land in the Awatere Valley has changed hands recently as high as $70,000 per hectare, while established Awatere vineyards sell for between $140,000 and $170,000 per hectare. As a distinct New Zealand wine growing region, the Awatere is second only to the neighbouring Wairau Valley in terms of production, accounting for around 30 per cent of Marlborough’s grapes. District pioneer Awatere River Wine Company, the Vavasour family’s business, attracted significant investment last year from the New Zealand Superannuation Fund, which also purchased the Awatere’s 200 hectare Altimarloch vineyard earlier this year for $33 million. Altimarloch is managed by FarmRight and sells grapes under contract to third party winemakers. Ministry for Primary Industries’ economic benchmarking for Marlborough viticulture in 2017 found growers in the region made $11,600 per hectare profit before tax, producing 14 tonnes per hectare, selling sauvignon blanc grapes for $1,755 per tonne. Growers are cautiously optimistic about the coming season. Although they forecast a reduced crop, they anticipate increased grape prices from better quality fruit. Confidence is evident in new plantings, especially by the larger wineries and contract growers seeking better economies of scale. Most large wine companies are established in the Awatere, with Yealands Family Wines particularly prominent. Yealands is now owned by local power company Marlborough Lines, which in turn is owned by the Marlborough community. Phil Dasler says that, although plenty of other varieties do well in the valley, one dominates. “Sauvignon blanc is the bread and butter, and essentially gives the grower a longterm guarantee of a return. However, plenty of other varieties also grow in the district, including chardonnay, pinot gris and riesling. “As a rule of thumb, Awatere vineyards historically yielded lower levels than those in the Wairau, though as vines have matured, some blocks are performing well. Now, with some of the more marginal areas of the Wairau in grapes, those perform lower than Awatere blocks, so the differential between the two areas has largely levelled out. “From an aesthetic perspective, with the river, terraces, elevation and great views down the valley, Awatere is probably a more pleasant district than Wairau to live or work in,” he says. Kilkishen Farm has been in the same family ownership since the large sheep station it was part of, Dumgree, was compulsorily acquired by the government, subdivided and auctioned off in 1912 to promote more intensive settlement. Joe Blakiston is confident of finding a willing buyer for the property. “Market interest is high and prices are firm across all classes and sizes of Marlborough viticulture land. Development land is at a premium. Corporate viticulture interests and significant investors are active. This is a desirable listing, in a strategic location, with reliable water and will be ready for 2019 planting,” he says. »» a 16.25 hectare Sauvignon Blanc production block on the outskirts of Blenheim; and an eight hectare Dashwood lifestyle property, five kilometres north of Seddon, with viticulture potential.